Behind my house there is a piece of land bordered by a stream. Along its banks grow large poplars and other plants typical of the alluvial plains. This is the place where an architect friend of mine asked me to make a “wild” garden. “Wild” because he cares for it only occasionally and uses no chemical treatments, allowing the vegetables to search for the power to produce themselves. In this garden, there are many varieties of rare and unusual vegetables. 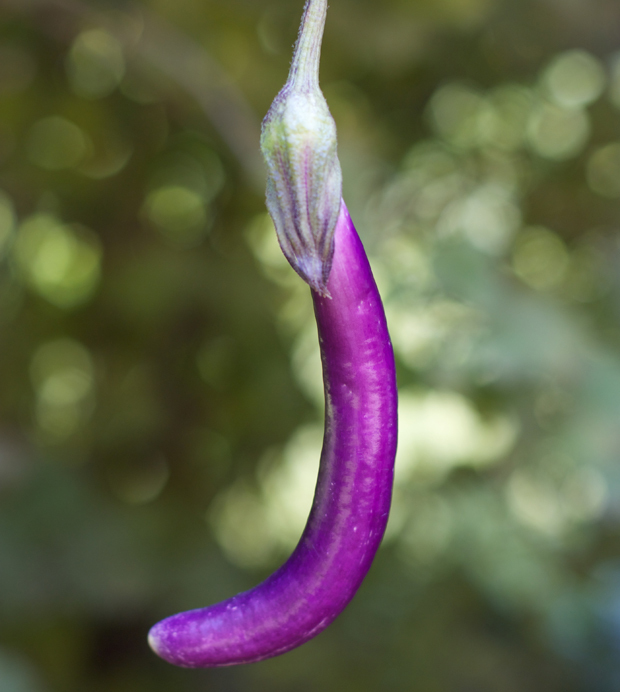 One day when I was walking through the garden I discovered two small banana-shaped light purple eggplants, (in the US they are known as Japanese eggplants). I collected them and I used them to make a typical Italian dish. For those who do not have a garden, I recommend buying an eggplant that is shiny, round, and firm. Cut the eggplant into small pieces, season with salt, and place in a colander for a half hour to let the water out of the eggplant. Boil the water for cooking pasta and add salt. In a pan, pour two tablespoons of olive oil and add the garlic. Dry the eggplant with a paper towel and add it to the pan when the garlic fries. Cook the eggplants over high heat, stirring frequently with a spatula until they are golden and soft. Turn off the heat and add a little chopped parsley. As soon as the water boils, add the pasta (the cooking time is indicated in the box). While the pasta is cooking, heat the tomato sauce with 3 tablespoons of olive oil. Drain the pasta, place the pasta on each plate, topping it off with a bit of tomato sauce, a little eggplant, and parmesan cheese. 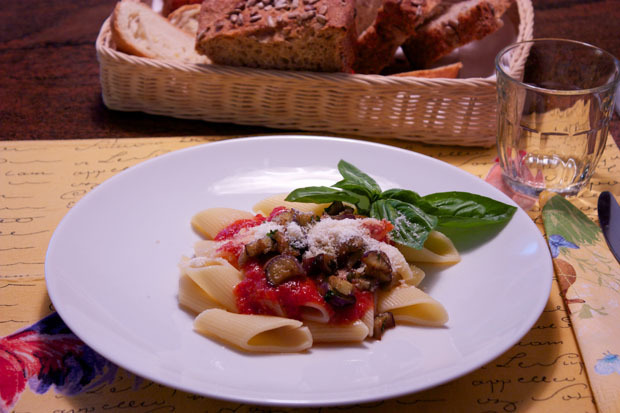 Posted in Pasta and tagged with Penne alle Melanzane, Penne with Eggplant. RSS 2.0 feed.